It was privilege to grace page 078 in the October 2010 issue #10 of the seminal Japanese fashion and culture magazine Free & Easy. As part of the Blue Worker feature, I was in good company along with local custom boot craftsman Julian Imrie. More on Julian in the post to follow. I thought I would provide a few details on what I was wearing, the process & such. 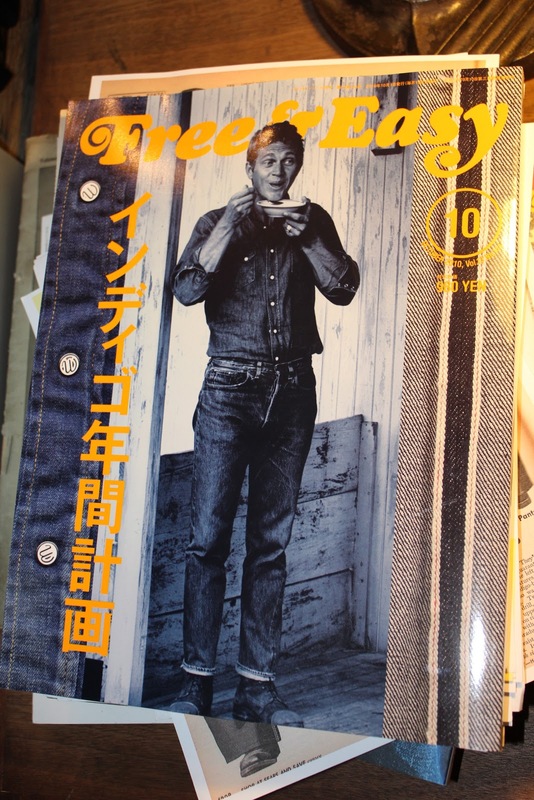 I was contacted by F&E and asked if I had carpenter jeans, coverall jacket & overalls to be used for the next issue which would focus on Denim. I replied that I did and that carpenter jeans were part of my daily wardrobe. They then asked for engineer jackets of which I told them I had many. Finally, I was asked for overalls with real wear & character, which I just happened to have though not currently part of my weekly rotation. 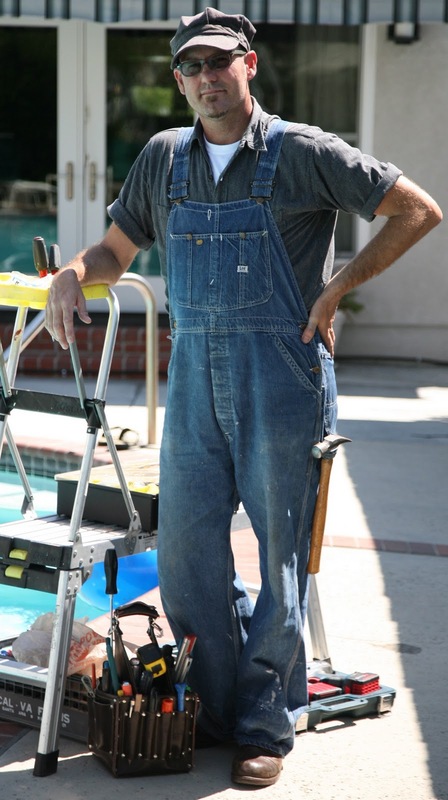 I have owned this particular pair of Lee Jelt denim overalls for about 6 years. I used to wear them on the job once or twice a week before either they shrank or I grew, so now they only get broken out once or twice a year while painting. I would have preferred to wear some carpenter jeans and a great jacket but hopefully another chance will present itself in the future. Not wanting to miss this golden opportunity, I gladly squeezed into the overalls and headed off to work. 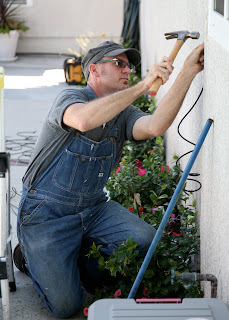 I was working on some drip irrigation in Burbank, California the morning the photos were taken. I remember it being about 11:00 AM and the temp already hitting 98 degrees, oh man, that pool was looking good. After the shoot I changed into my carpenter jeans, handed the overalls and a few of my tools off to Akilla to take and photograph under better conditions and finished up my work on the drip system. Loomed inside tag, note Made in the USA. 1996 RRL Made in USA salt & pepper work cap. This salt & pepper work cap is the first piece of Double RL that I purchased back around 1996 and to this day is still a favorite. I was the beginning of my love for the iconic label and all things salt & pepper fabric related. 1950’s era OshKosh promotional bandanna. I have become a big time fan of bandannas these past few years for both wiping my brow & for soaking in cold water for instant cool down on hot days. This Osh Kosh version was picked up a few years ago as deadstock and had recently been added to the rotation. All Valley Handyman Service tee shirt. The All Valley Handyman Service tees are American Apparel hand screened here in Southern California and feature the backside inspirational quote by Carhartt clothing founder Hamilton Carhartt, with who I share the same basic concept of how to run my business. Big thanks to Jonathan & crew of Fresh Pressed for all their great work. Red Wing Iron Ranger 8112 boots. These have been my daily work boot for the past year give or take and are holding up great. The smooth cork sole is ideal for not trapping dirt or rocks like a lug sole and wears much better than the crepe soles. I also like these boots for their wide toe box that provides plenty of room. Some of my Irish Setter type Moc-Toe boots are a bit cramped & claustrophobic. THORLOs are the best socks I have ever worn. They make a huge difference when standing on your feet for a good part of the day. A great example of value for your dollar & quality that lasts, not to mention still proudly made in the U.S.A. They also have the nicest customer service ever and free shipping with purchase of 3 pair or more. I even seem to recall them having a yearly sale. Support their good work! I have worn Persol sunglasses for over 10 years, so last year when the time came to get prescription glasses these Persols with transition lenses were my first choice. I recently converted this pair of new old stock Persol sunglasses to prescription lenses so now I’m covered both inside & out. Leather tool bag. My alternative to the conventional tool belt to hold the basics. Big thanks to Zip Stevenson for the hook up, Akilla Kojima for the nice photos & the folks at Free & Easy for the great magazine.